Google Analytics is the best freebie a website owner could ever asked for. However, most have neither knowledge, nor time to tap into its potential. The custom Google Analytics dashboards in this post take but a click to set up in your Google Analytics, yet give you all the analytics you need - without breaking a sweat. Google Analytics is the roadmap that bridges the gap between where your website is today and where you’d like it to be tomorrow. Google Analytics looks complicated and intimidating. You don’t have the time and knowledge to conquer it. That’s why Google Analytics dashboards are the answer. 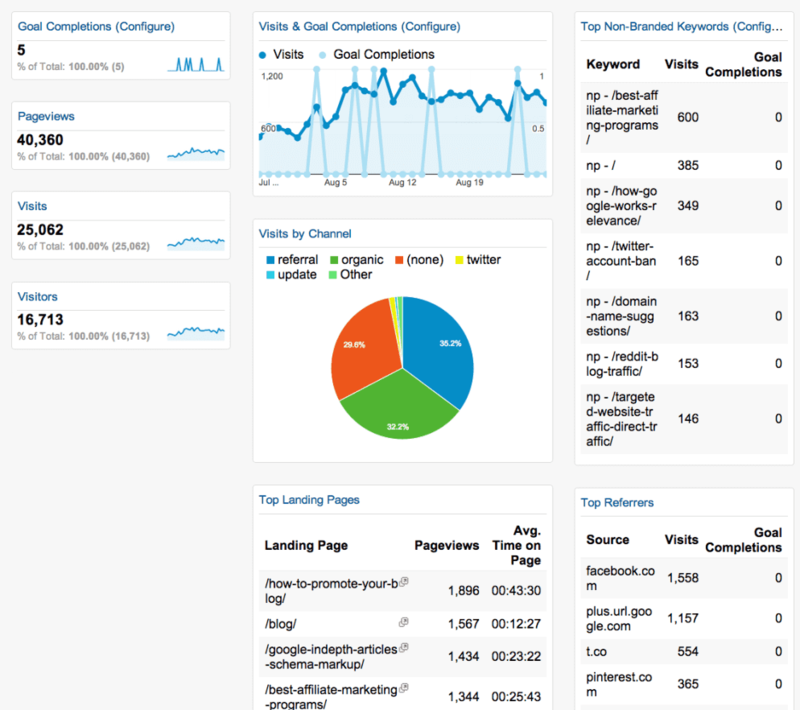 What is a Google Analytics Dashboard? A Google Analytics Dashboard is a customized set of data that gives you an overview of how your website is performing in any given area, like Social Media, SEO, and so forth. In other words, a customized Google Analytics Dashboard takes a pile of Google Analytics data and organizes it in a way that gives you a clear snapshot of your website performance. Who customized the data in the Google Analytics Dashboards below? People who are more knowledgeable about Google Analytics than you are did. All you need to do to benefit from their knowledge is download these customized Google Analytics Dashboard Templates into your Google Analytics profile. Click the green Add This Dashboard to your Google Analytics button located under each dashboard. 3. Choose the profile you’d like to download the dashboard to. Feel free to rename it! Go to Customisation => Dashboards. Everyone who runs a website and wants to know more about their readers. WHAT CAN YOU TRACK WITH IT? Which links drive traffic (and which ones don’t…)? How do people like your website when viewed on their mobile devices? All the essential stats – bounce rate, page views per visit, new visitors – for each landing page. Learn which social media network brings the most traffic. See which social media activities (likes/+1’s/shares/comments) are preferred by your readers. Find the best days to be on social media. Know which posts performed best on social media. Anyone who collects leads (email opt-ins, for instance) on their website. SIDE NOTE: you need to set up goals in your Google Analytics in order to use this dashboard. Learn more about setting up goals from Google Analytics Help. To learn about setting up goals to track email conversions, take a look at Kristi Hines’ post at GetResponse blog. How many actual leads does your web traffic amount to? Which keywords drive the most sign-ups? Which referrers send you the best converting traffic? What is your best performing content? If you prefer to track sales vs leads, download this eCommerce dashboard. To track mobile eCommerce stats, download this Mobile eCommerce dashboard. WHO NEEDS WANTS THIS DASHBOARD? Anyone who loves to keep tabs on what’s happening at your site right now. Where is your traffic currently coming from? What content are they viewing? Five custom Google Analytics dashboards installed in your Google Analytics profile in five minutes or less. All the actionable stats you need to keep your finger on the pulse of your site without getting overwhelmed. With huge thanks to: Koozai, Econsultancy, and Portent for giving great examples of Google Analytics Dashboards. Great write up ana. I always wanted to find good way to configure my analytics board. This post helps me a lot. You are so very welcome, Surendra; thanks for coming by. It’s been a long time since I’ve been on your blog. Looks like you made many changes since last year! But that’s a given for all of us bloggers. All I know is that you’re always delivering great material and this post is the ultimate thus far! I love the information your provided here. I’ve been studying GA off and on for a while, installed some metrics, but I’m always looking for more dashboards to help me improve my statistics. Thanks for the time and effort you put into this post. Now it’s time for me to implement! This is a nice try to help people collect actionable data and save time. You made a lot of effort to test those dashboard yourself and now you kind of endorse it with your name. I think many people will download the dashboards and try them. As for me I think I will wait a little bit. I will start with the long and full of headaches journey to study Google Analytics. That is why I joined Digital Analytics Fundamentals. You probably know about this free Google Analytics course for beginners that starts on October 8. Many people, including me, wrote articles about that. I prefer to get the basic concepts and strategies there. After the foundation is laid, It will be easy for me to come back and study these dashboards. If I find them useful for me, I will add it myself to my G.A. profile. Since then, I do agree that these may be very helpful for many people so the least I can do is share this post wherever I can. You made a lot of effort to test those and we all appreciate it. Google Analytics is by far the best resource of its kind for monitoring website data. I haven’t done much customization to my dashboard, but I’m going to try these changes out. Thanks for the great direction. Thanks for sharing these awesome custom Analytic dashboards ANA. Guess, i could go and install them right away. I love how this post reflects your no-nonsense, “Just the facts, ma’am” style. Elsewhere on this blog (One-way Link Building: How to FInd the Best Links Every Time) I saw the straightforward, simple yet POWERFUL technique for finding exactly which blogs you should target. Here in this post, you have outlined the tools for doing intelligence work on your OWN blog, which is just as necessary. Thanks for providing the tools here for bloggers to know themselves and the landscape as well. I’ve been missing reading the Weekly Skinny, have you discontinued it, or just become very busy? Hope all is well. Appreciate you and Traffic Generation Cafe. Love the quote, Kurt – as true as it gets. Yes, I’ve been busy with house remodeling, so had to step away from the blog, but trying to slowly get back into it. Thank you so much for sharing this custom GA dashboards Ana! You are very welcome, Levin. This information is great when you have a blog like yours with an Alexa ranking of #13,118 and US ranking of #6373. which mean you have around a 5000 visit per day. So analytic will just help you monitor and enhance your work. But when you have a low traffic it is disappointing and discourage to have Google analytic. how ever maybe i will get back to this post in few months and will be happier and more successful 🙂 Thanks Ana you always know how to master traffic. Good point, Jossef, but remember we all have to start somewhere. Thanks Ana for sharing those Google Analytics dashboards. I particularly like the SEO and Social Media dashboards. You are so very welcome, Cole. Hi Ana. I never knew you could do all this. I have added a couple of these dashboards to some of my sites. I really like the blog overview and social media ones. They are pretty handy, aren’t they? I downloaded all, gonna have more statistics of my website now! Thanks Ana! You are very welcome, Anirudh. I love using dashboards. They help you get that quick overview of what’s going on with your website. The dashboard you shared here are pretty darn good. I tried them all out. Love them. It’s crazy how much you can do with Google Analytics that is right under our noses. Informative article you have written, no doubt. The great thing about Google Analytics is that you can customize it in just about any way possible when it comes to reporting and dashboards so the most important information is right at your finger tips when you need it. If you’ve got a few hours to spare it’s fun to play around with and see what cool tools there are. Thanks for stopping by, Dimillo. what a nice figure in your analytics, I hope i can achieve those statistics in my dashboard.More Power Ana. Great write up. I check out my analytics at least 5 times a day. The real time feature is sort of addictive. I love being able to track visitor flow and it helps to find ways to improve on weakest pages of my site. 5 times a day? You definitely ARE an addict, Stephen. Very, VERY cool post, Ana. I’ve just recently decided to really get in to Google Analytics and start tracking EVERYTHING on my blog. I’ve actually spent a good part of my day brushing up on it and implementing somethings I’ve learned from watching tutorials and now from this post, so this is right on time for me. Glad to hear you decided to take the bull by the horns, Ti! 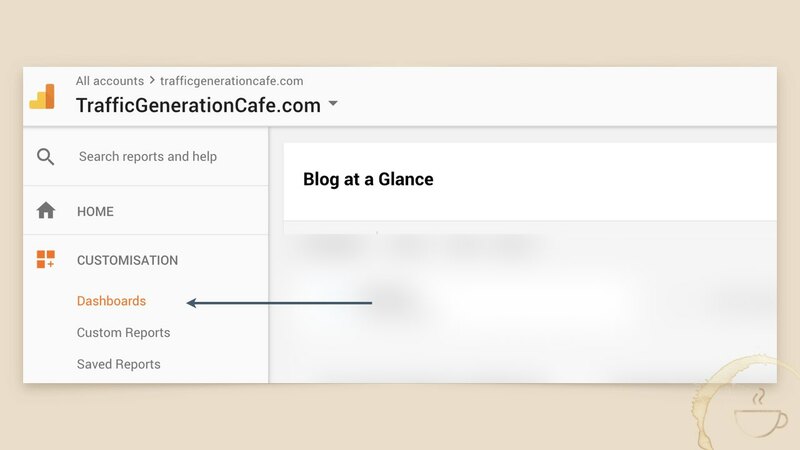 Hey anna, you have shared one really usefull article , i really enjoyed it.One other thing i loved about your blog was your signature under the post can you tell me how can i get one for my blog too? Glad you enjoyed it, Hamza. My signature is an image – I created it on a Bamboo pen. You can also go to http://www.mylivesignature.com/ to create yours; I am sure there are plenty of other sites that will do the trick. I really enjoyed reading your post and i’ve download them all. No doubt google analytics is an awesome freebie which is very useful for all bloggers. Glad to hear it, Sohail. What a brilliant roundup, Ana. I hate to admit that I don’t use Google Analytics to its full potential. Just too much clicking around — always seems too much effort. I’ve downloaded a couple of the dashboards already. Thanks so much, your hard work is much appreciated. So glad to hear it, Gurwinder! Thanks for sharing this! I’ve added most of the dashboards to my Analytics and this will allow me to delve deeper into data that will help me make the most out of my site. You are very welcome, Gerri. thanks so much Ana, I just put all these on my Google analytics account, it was so easy! Now I’m looking forward to checking my stats, instead of putting it off, makes a huge difference when everything is easy to find. I know what you mean, Julieanne; glad to help! Great post Ana! I think these dashboards will be very useful for anyone who wants to measure their efforts. Thanks for sharing this awesome stuff. Here is another post from CrazyEgg about 5 more custom dashboards : http://blog.crazyegg.com/2013/03/11/google-analytics-custom-dashboards/ I know it might sound spammy, dropping links in the comments section but felt worth sharing and adding up to the list. Thanks, Sourav, and no, it’s not spammy when you mention relevant resources. Checked out the post; glad to see I covered the ones mentioned there. I want to use these right away! (Too bad I don’t have a blog now, but this could certainly be useful when I start a new one). Thanks for sharing the tools, Ana 🙂 Social Media dashboard and Leads dashboard will be ones most useful to me (Google already has an inbuilt Social media stats, but this one seems to be better). Ana, these are fantastic! I just downloaded all of them and they give me a great new perspective on Analytics. No more having to dig for the information. Thanks for posting this! You are so very welcome, Jason – I loved how simple this was as well.